SLOW FADE. 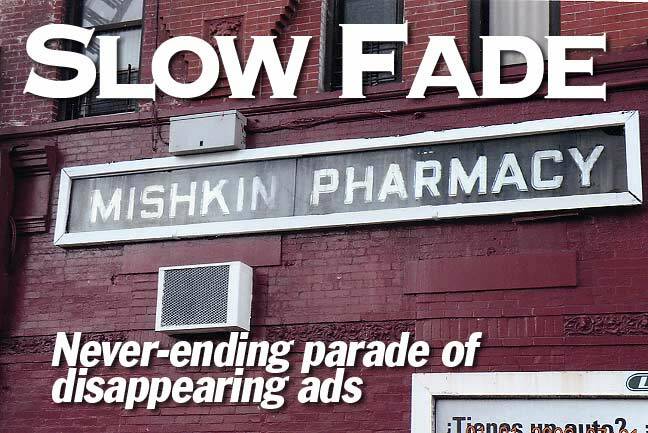 Never ending parade of disappearing signs. Just when you think you’ve found them all… you just keep discovering even more. 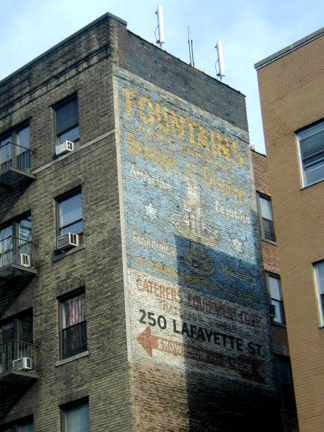 That’s the story of Forgotten New York’s fascination with ancient building advertising — there are still painted ads on buildings that come from as early as 1890, and new ads are added all the time that, in 50 or 60 years’ time, will look as quaint as, say, the Victorian-era ads from this FNY page. The beat goes on, as Sonny Bono once put it, and as sure as I’m sittting here, everything we know today, from HDTV to Twitter to facebook to google to digicams to other devices that clutter up our lives will be passé by… this is 2009 … let’s see… 2011? American Idol will be seen as a 2000’s phenomenon and it will be remembered not on VHS tapes (as my old movies are preserved) but as bits and bytes on youtube or whatever has replaced it. I’d like to jump in the H. G. Wells model Time Machine and set the lever for 2050; when, as Wells put it, “when men are still men,” and see what has taken the place of what’s here now. Someone may well be reading this in 2050 — you should know that I was wondering about you. 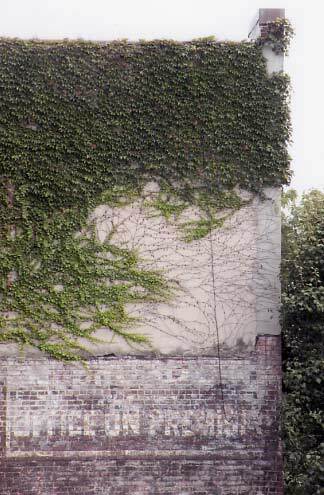 Philosophy and speculation aside, here’s some stuff shot over the last few months by FNY’s ex-MTA bus driver Gary Fonville, who’s seen it all on his routes around town. 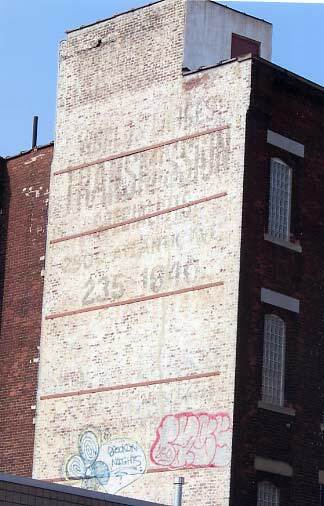 Relatively recent stuff here, so it’s not as egregiously ancient-looking (in earlier decades ads were — how do I phrase it — they were just courtlier )– but some, I’m sure, have the whiff of a different world about them. That’s because I can’t imagine some of the really older ads coming from the same country, much less the same city. You know what, though — in 2050, they’ll be saying the same thing about 2009, guaranteed. 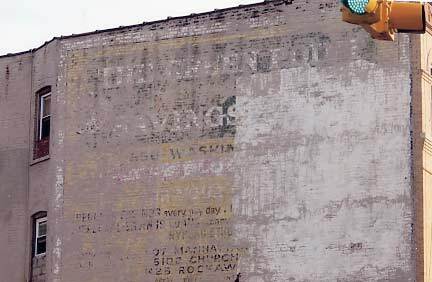 LEFT: An unidentified automobile dealer has advertised here many years at 137th Street & Malcom X Blvd (Lenox Avenue). 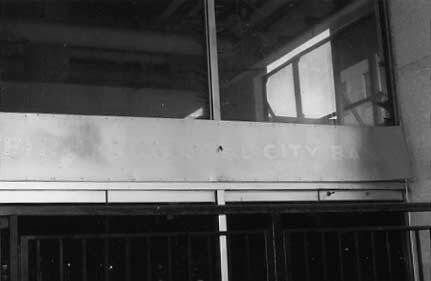 RIGHT: First National City Bank’s traces can be seen here on stainless steel at the old NYC Transit Building at Willoughby & Jay Street in Downtown Brooklyn. This may be FNY’s first faded sign written on stainless steel. LEFT: Sunkist soda makes a recent appearance at 65th Street & Fort Hamilton Parkway in Borough Park/Bay Ridge, Brooklyn. RIGHT: Talk about recycling, here it is. 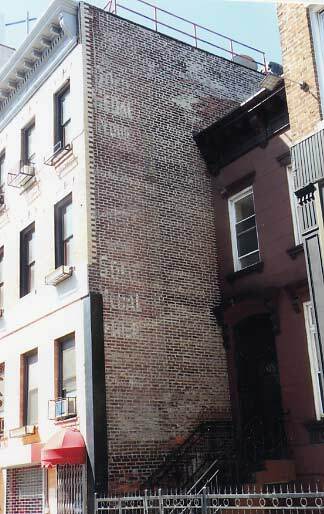 An apartment building at 181 E. 200th Street in the Bronx advertised vacancies by painting over an old General Electric sign. 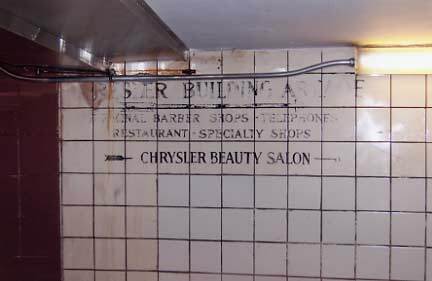 It’s very likely that under the white paint is a mention of a then-new invention called mechanical refrigeration that was provided by General Electric. 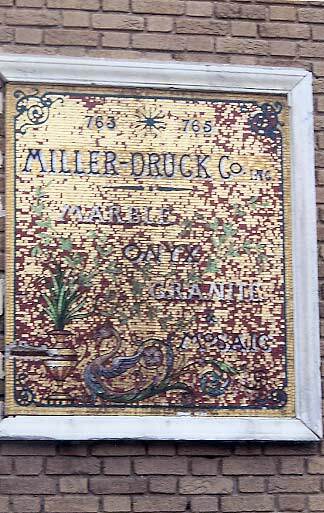 LEFT: This sign is composed of tile that notes the Miller-Druck Company [who are still around] at 133rd Street & Willow Avenue in the Port Morris section of the Bronx. 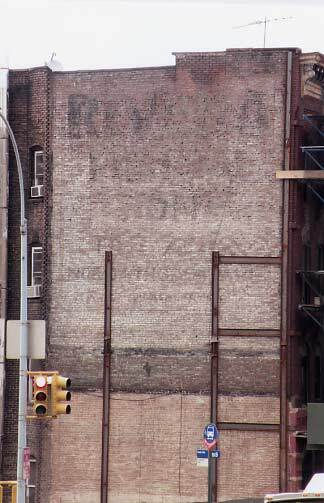 RIGHT: What’s left of this Sylvan Lawrence Real Estate sign is at Fulton Street & Broadway in Manhattan. 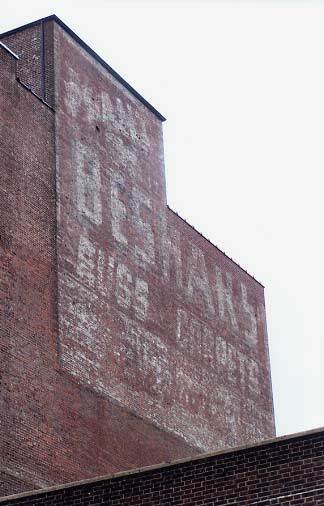 LEFT: New or used cars were advertised on this faded sign at Monroe Street & Bedford Avenue in Bedford Stuyvesant, Brooklyn. RIGHT: 149th & Southern Boulevard hosts part of a sign in Spanish. Reservations could be gotten for cars and hotels by this company. ” Nuevo Servicio Seguros de Carros” can be loosely translated as new insurance service for cars. LEFT: Another partly unintelligible sign. One thing can be said about this restaurant is that it served wines and liquors. 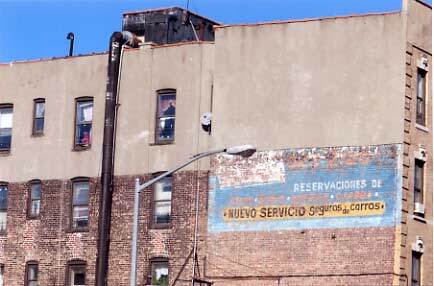 Can be seen on St. Nicholas Avenue and 181st Street in Washington Heights, Manhattan. 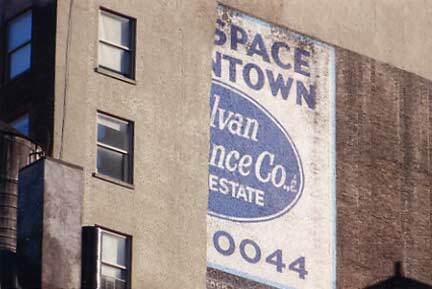 RIGHT: Not all of the faded signs on FNY are decades old. 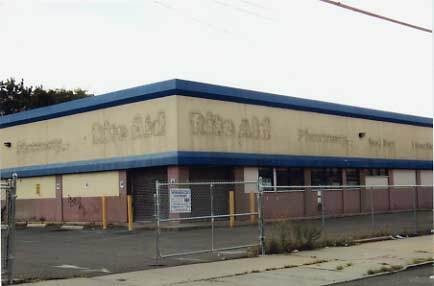 Rite Aid left traces here on Metropolitan Avenue near Flushing Avenue in Queens. LEFT: FNY records signs that have been uncovered after many years of being in hiding. This sign for Rivera Funeral home was photographed last summer. 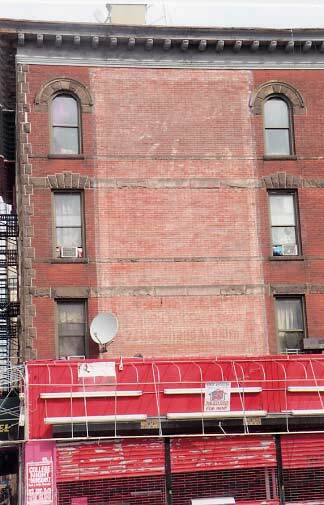 New construction will most likely put this sign back into hiding at 161st Street & 3rd Avenue in the Bronx. 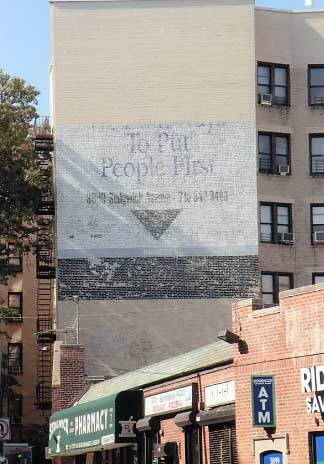 RIGHT: How many of these are left in NYC? 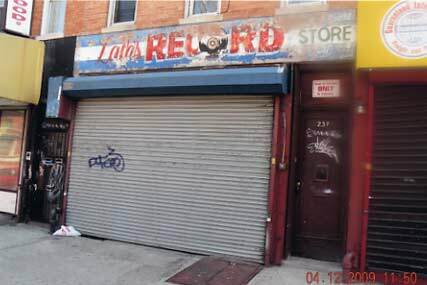 With digital recording techniques in vogue, record shops have virtually ceased to exist. Kingston Avenue near Park Place in Crown Heights, Brooklyn. 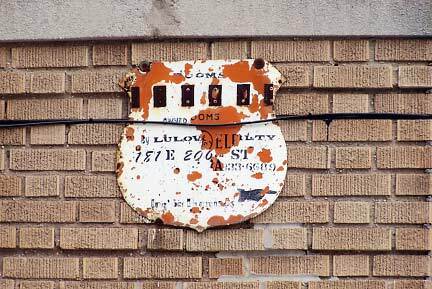 LEFT: Transmissions repair sign at Atlantic Avenue near Warwick Street. 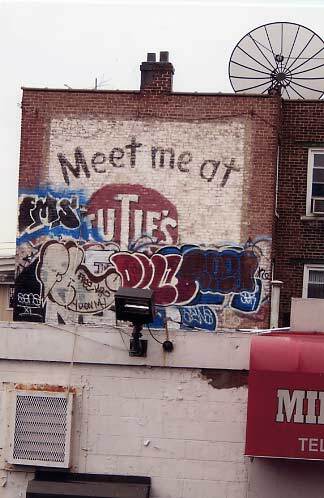 East New York, Brooklyn. 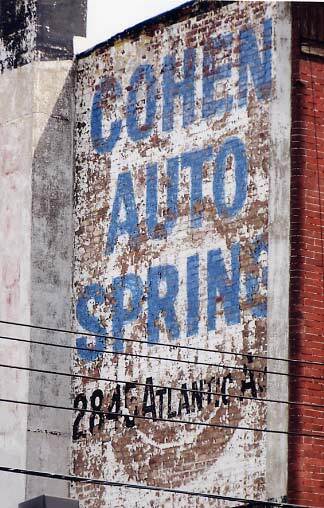 RIGHT: Cohen Auto Spring at 2845 Atlantic Avenue. Are auto springs a dated technology? Do cars even use springs now? 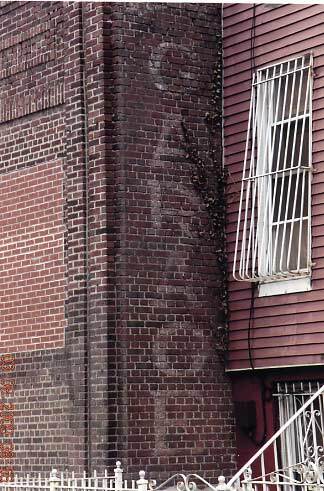 LEFT: nearly faded gem can be found on E. Tremont Avenue between Webster & Park Avenues in the Bronx. 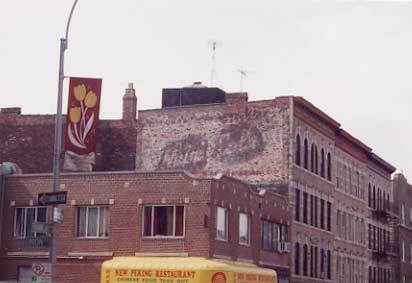 RIGHT: Seems like some sort of fire was near this Loew’s Kings Theater sign on Flatbush Avenue near Beverley Road in Flatbush, Brooklyn. 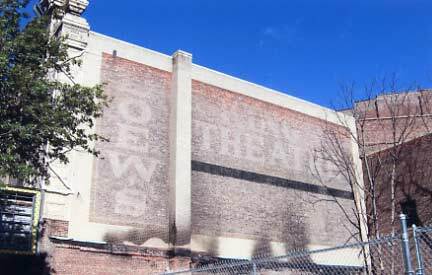 According to Cinematreasures, this theater had nearly 3700 seats (can you imagine that today?) It opened on September 7, 1929 and closed during the 1970’s due to low attendance. 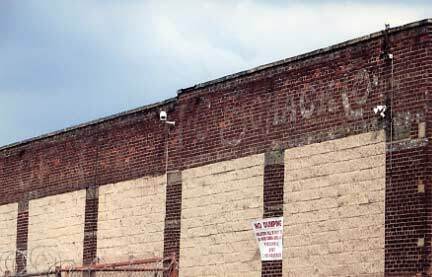 LEFT: Pacific Packing & Warehouse had a facility here on Blake Avenue not far from Fountain Avenue in East New York, Brooklyn. 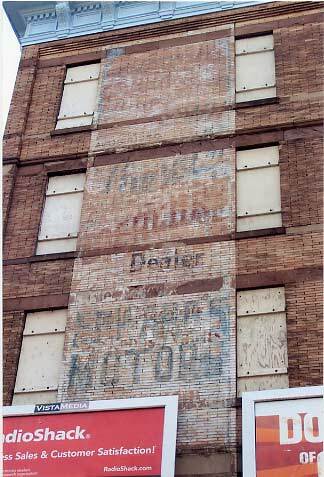 RIGHT: A durable Coca-Cola and Chesterfield cigarettes sign have withstood the ravages of time. 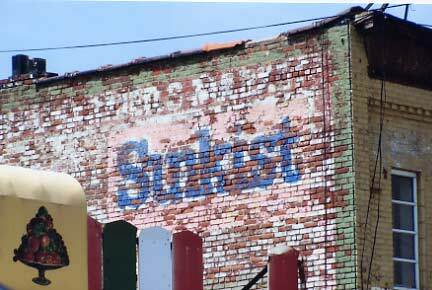 Coca-Cola has endured as an ongoing brand while Chesterfield has almost disappeared, if it hasn’t already. 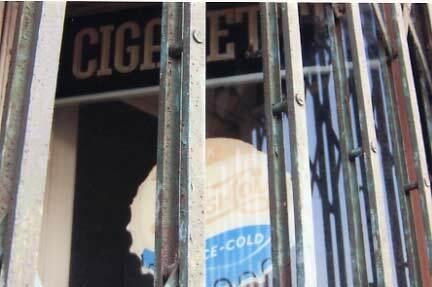 Can be seen in a storefront on Grand Street near Roebling Street in Williamsburg, Brooklyn. 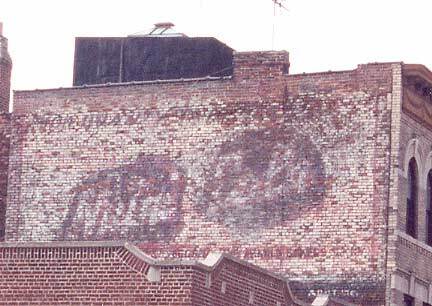 LEFT: FNY has noted old signs for Bendix washing machines at 23rd Street & Avenue of the Americas and at Bedford and Myrtle Avenues in Brooklyn. 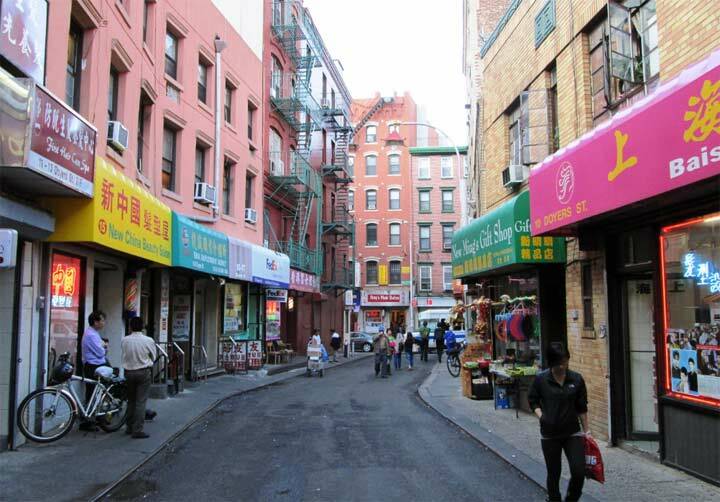 This one on 1st Avenue near 100th Street in East Harlem is very easy to miss. 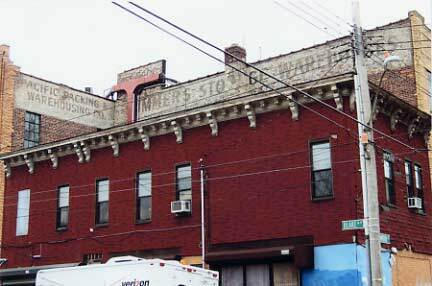 RIGHT: This sign for stables can be seen in its fading beauty at Stuyvesant and Gates Avenues in Bedford-Stuyvesant, Brooklyn. While the building is no longer used as a stable, it still houses modes of transportation – for both the living and the dead. It’s used primarily as a storage facility for limousines used in funerals and for hearses. 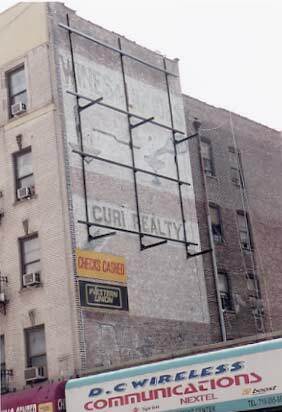 LEFT: Curi Realty and a Wine & Liquor store advertised here at 180th Street & Southern Boulevard in the Bronx. 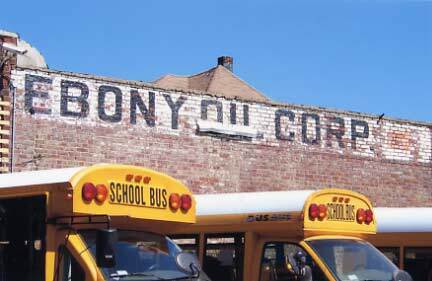 RIGHT: After the inception of Ebony Magazine in 1947, many businesses owned by African-Americans then used the name. This may be the case here at a business on Merrick Boulevard in Jamaica, Queens. LEFT: “Foreing” cars could be fixed here? 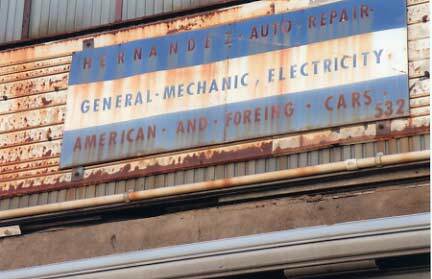 Red Hook, Brooklyn — can’t remember exactly the location of this misspelled sign. RIGHT: Does this place glow in the dark? 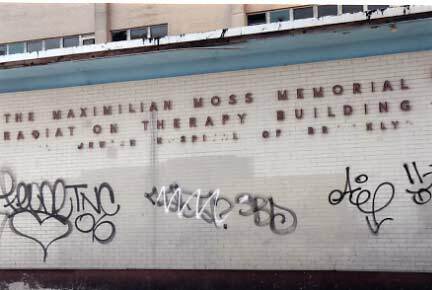 The former Maximilian Moss Memorial Radiation Therapy Building is on the side of the former Jewish Hospital in Crown Heights, Brooklyn. 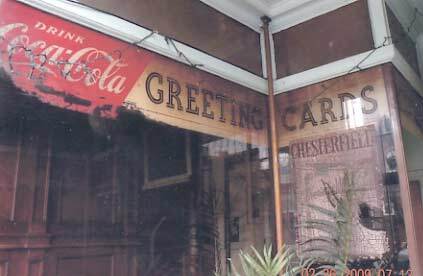 LEFT: Like the Coca-Cola and Chesterfields ads above, this painted on glass sign has been very durable. 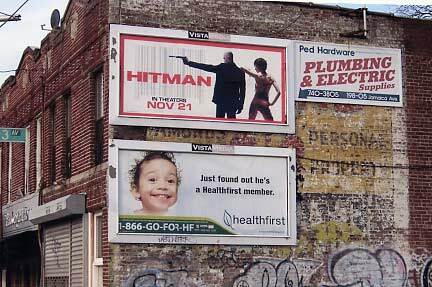 It’s on Kent Avenue near the Williamsburg Bridge. 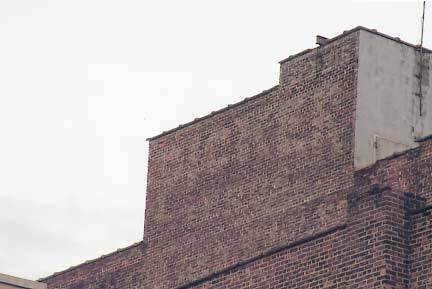 RIGHT: Whipple Street in Brooklyn in the host of this sign that was meant to be seen at a distance. 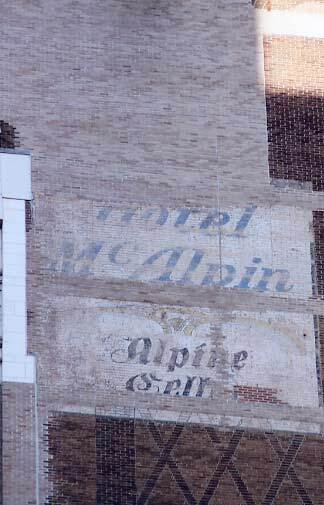 However, new construction almost made these signs disappear. 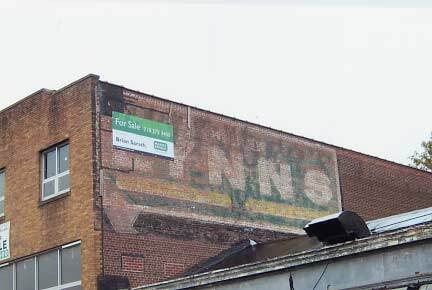 LEFT: Lynns advertised with this sign near 169th Street & Jamaica Avenue in Jamaica, Queens. 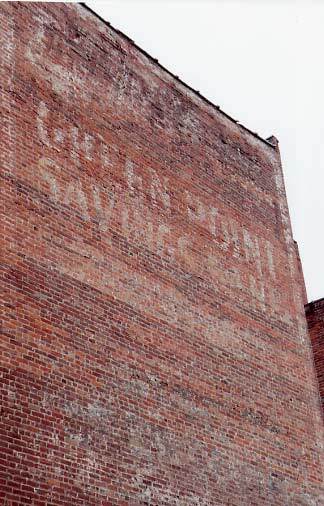 RIGHT: Green Point Savings Bank has left two traces of its former self. In these days of contstant banking mergers, it has been a victim. Green Point is now [well, 2009] known as Capital One Bank. Classon Avenue & Lincoln Place in Crown Heights, Brooklyn. LEFT: Green Point again, Rockaway Parkway near Riverdale Avenue in Brownsville, Brooklyn. 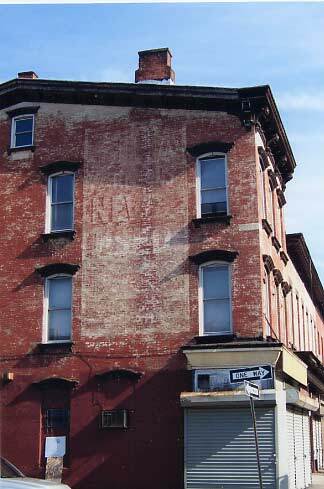 RIGHT: Some sort of business had offices on the premesis at Columbia & Warren Streets in Brooklyn. 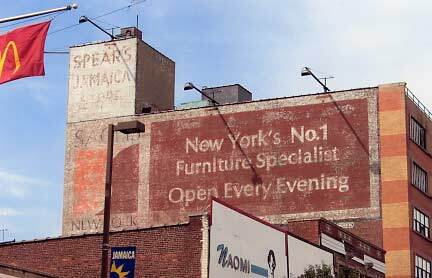 In a photo taken a few years ago, this sign is now almost gone and is partially covered on Franklin Avenue in Crown Heights, Brooklyn. [Can’t make it out]. 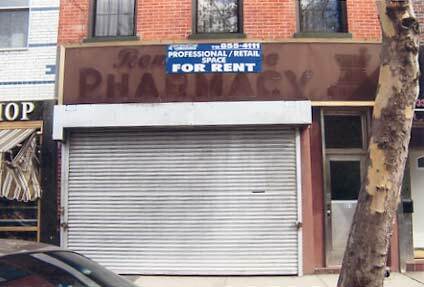 LEFT: A pharmacy like this one may been a victim of the mega pharmacies such as Walgreens, Rite Aid and Duane Reade. 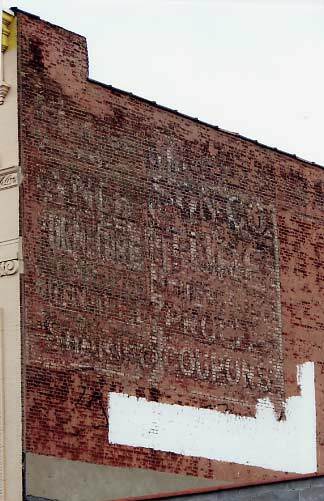 Smith Street was the home of this pharmacy. 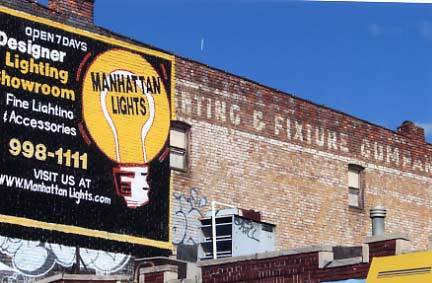 RIGHT: Avenue P & Coney Island Avenue is the location of this partially covered lighting and fixture company. LEFT: ForgottenFan James Burke: Tuties was a bar in Queens, on [88-19 Liberty Ave]. It was unique in that every piece of memorabilia you could think of was in the bar. Hanging from the ceiling, on the walls on the floor, unbelievable. You could bring something in and they would hang it up. For a price, you were allowed to hack out a piece of the bar, don’t know how they allowed that & kept the bar standing but they did. Bells & whistles all over the place, especially in the ladies room! What a place! 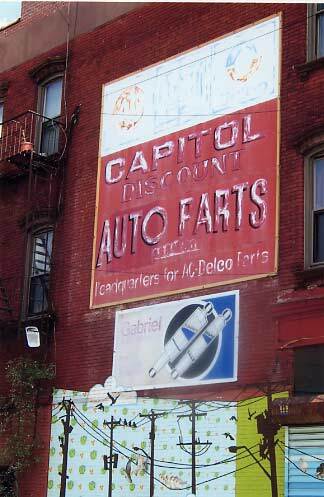 RIGHT: Beshar’s can or could clean your carpets here on Park Avenue & 140th Street in the Bronx. LEFT: You could park your car here on Nostrand Avenue at Willoughby Avenue in Bedford-Stuyvesant. Not any more. It’s now used by a commercial laundry. 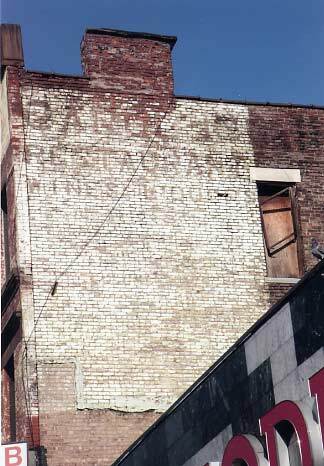 RIGHT: A building on Sedgwick Avenue in the Bronx hosts this partial sign. 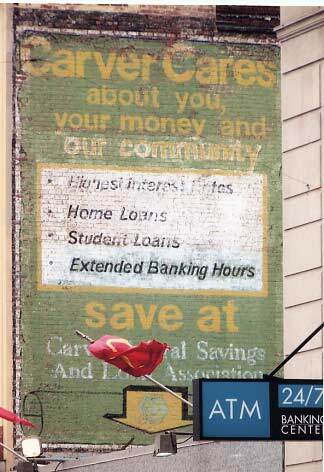 The bank advertised is presently Ridgewood Saving Bank. In these days of banks constantly merging, I say “presently” because who knows what it will be next year or even next week? 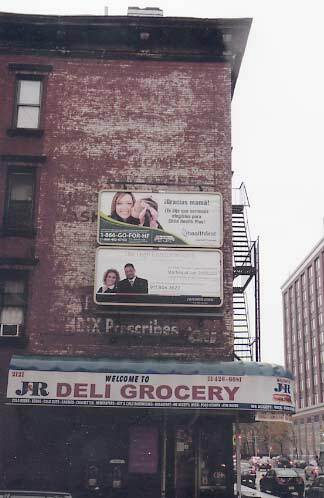 LEFT: 250 Lafayette Street in Soho is pointed to by this sign in Soho (South of Houston) in Manhattan. 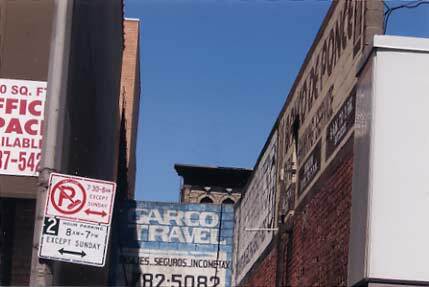 RIGHT: Devoe Street and Bushwick Avenue is where this worn auto parts sign can be found. LEFT: 728 Nostrand Avenue in Crown Heights, Brooklyn is where shoes can be purchased. Got here just in time before it fades at Bergen Street & Nostrand Avenue. 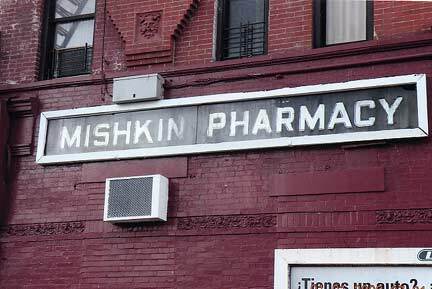 RIGHT: Jefferson & Nostrand Avenues is the location of this nearly faded one. According to the Betty Crocker (which now distributes Gold Medal) website, the flour was created in 1880 by the Washburn Crosby Company. 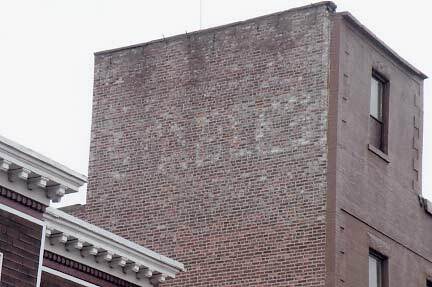 The company was then acquired by the General Mills Company, which still exists today.